Harvey H. Kaiser is the president and founder of Harvey H. Kaiser Associates, Inc., a consulting firm providing services in architecture, urban planning, and facilities management. Previously, he was a senior administrator at Syracuse University. His books and articles on facilities management, higher education administration, urban planning, and historic architectural preservation place him as a leader in those fields. Author(s): Harvey Kaiser - Harvey H. Kaiser Associates Inc. The vast expansion of higher education in the 20th century and a relentless pace of new construction left a legacy of unmet capital needs for renewal and replacements. Two forces converged to present higher education with a substantial maintenance backlog: normal aging of capital facilities and the subsequent need for cyclical renewal of building and infrastructure subsystems; and the obsolescence of facilities to meet dynamic needs of the academic enterprise, including changing pedagogy, information technology, and a shift from traditional college-age students to a more diverse student profile. Today's buildings, grounds, infrastructure, and equipment amassed to house and support academic programs are the legacy of the dramatic growth of new and existing campuses. More than half of the current campus facilities organizations were developed after World War II, when enrollment grew 600 percent, from 2.3 million students in 1950 to more than 20 million students by 2016. During the same period, the number of institutions grew from 1,800 to more than 4,000. New institutions, primarily publicly supported two-year colleges, opened at a rate of one every two weeks from 1955 to 1974. Facilities also expanded dramatically during this period. Buildings were opened annually, sometimes several in the same year, and construction cranes on the skyline and mud-covered walkways were common campus experiences. Driven by financing demands for capital construction and tight delivery schedules, many of the new facilities evidence a lack of durability and adaptability for alternative uses. The major share of construction was for new facilities, with little reinvestment allocated for existing facilities. The glamour of planning new facilities and the excitement of ribbon-cutting ceremonies overshadowed the obsolescence and decay of earlier campus buildings. "Old Main" was slowly fraying at the edges while newer facilities entered their own cycle of deterioration. Currently, many institutions not only are facing the challenge of an increasing debt burden due to an aging facilities inventory, but are also planning to replace or renew their facilities using debt. After many years, these factors produced a legacy of deferred capital renewal and the accrual of backlogs for major repairs, replacements, and renovations to facilities and infrastructure. By failing to fund renewal for building subsystems and infrastructure with expired life cycles, higher education began its slide on the slippery slope of failing facilities. Today, the problem is acute for the many institutions that may have as much as 75 percent of their facilities in the range of 30 to 40 years old –– and be past a first cycle of major renewal expenditures. The graphic portrayals of scaffold-protected exterior walls, students huddled in overcoats in unheated classrooms due to failing heating systems, and laboratories with "Closed for Repair" signs introduced an awareness of the issues. Studies published by higher education associations in the late 1970s and early 1980s identified rapidly accruing backlogs arising from the shortfall for maintenance, capital renewal, and modernization that reached many billions of dollars. And our higher education national infrastructure was not the only problem. Simultaneously, the national public infrastructure was defined in America in Ruins: The Decaying Infrastructure.1 A national debate on the infrastructure crisis illustrated by crumbling bridges, collapsing utilities, and disasters involving loss of life reinforced higher education's problems. The transition from a largely random and episodic process of selecting and funding one-off renewal projects to early forms of comprehensive renewal planning occurred with the first wave of deferred maintenance backlog planning in the late 1970s. It began to be noted that the backlog accumulation bore significant implications for subsystem and infrastructure reliability, health and safety issues, and functional use of space. Some troubled campus administrators took stock of conditions and began to use the term deferral of major maintenance. From the late 1970s to the early 1980s, the national higher education associations, recognizing a problem that was of potentially enormous fiscal and functional impact to campuses, began to devote agenda items on national and regional meetings to this subject. They also began to publish guidance on what became known as deferred maintenance. Deferred maintenance was defined as major maintenance or capital projects that had gone unfunded in previous budget cycles. Deferred maintenance became a universally adopted part of the vocabulary of higher education. During this period, efforts to document condition deficiencies more systematically and to prepare data on which to plan corrective measures came in the form of the Facility Audit. The methodology was documented in the Facilities Audit Workbook in 1982.2 Jointly sponsored by APPA and the National Association of College and University Business Officers (NACUBO), a simple format, building on work by the Tennessee Board of Higher Education and military agencies, described a process that produced comparative ratings of campus facilities conditions. In 1993, APPA's The Facilities Audit provided a cost-deficiency technique to measure the extent of maintenance backlogs. It is common now for many statewide public systems and individual institutions to annually report findings of condition inspections, although, on many campuses, assessment of deteriorating conditions was still largely episodic, sometimes related to campus master planning. From the very beginning, when the facilities audit began to catch on as increasingly common practice, uncertainty prevailed about whether to include the prospective costs of subsystems life expiration, because prospective costs of renewal did not fit within the definition of “unfunded in previous budget cycles.” If these costs anticipated in the future were included in reports of what was called deferred maintenance, then those deferred maintenance backlogs ballooned to disproportionate amounts, because they included both past accumulated deficiencies and projected future needs. The result was that many institutions and public systems experienced instant rejection of unreasonably large funding requests, sometimes presented as an “urgent one-time need.” The shock wave in those reactions then led to resubmission of capital funding requests significantly understating real needs, but formulated to gain acceptance for at least partial funding. Capital renewal and major maintenance or major repairs and replacements (R & R) are synonymous. They are funded the capital funds budget and not from normal maintenance resources received in the operating budget cycle. However, major maintenance, in some cases, is included as a routine part of current fund operations and maintenance and included as operating budget expenditure in the category of non-capitalized work. In other cases, an accounting decision can categorize a project as capital renewal and treat it as capitalized work. The need to fix rules, typically by a minimum dollar threshold for capital renewal, avoids this confusion between O&M and capital renewal funding. A capital renewal program is a systematic management process to plan and budget for known cyclic repair and replacement requirements that extend the life and retain usable condition of facilities and systems and are not normally contained in the annual operating budget. Capital renewal is a planned investment program that ensures that facilities will function at levels commensurate with the academic priorities and missions of an institution. Included are major building and infrastructure systems and components that have a maintenance cycle in excess of one year. Renewal and replacement is an accounting term used to distinguish a subgroup of plant fund assets from capitalized plant additions and improvements. However, institutional accounting practices vary; decisions are sometimes made to capitalize portions of major maintenance and renewal and replacement. Replacements in the form of new construction are routinely designated as capitalized and are grouped together with renewals as capital renewal and replacement programs. As a form of capitalized construction, replacements are interchangeable with new construction, whether they are actually replacing an existing facility or are an addition to the plant. Linking capital renewals with replacements is a more accurate way to describe a program for renewal of existing plant assets as distinguished from totally new additions to plant assets. The scope, complexity, cost, and duration of a project can dictate whether major maintenance should be supervised by maintenance management or by a separate design and construction department. As an alternative to using in-house maintenance and design staff, a major maintenance project requiring plans, specifications, and competitive bidding can be designed by consultants and constructed by contractors. Capital renewal and replacement usually requires external assistance in design and construction administration to avoid dedicating facilities management staff to lengthy, time-consuming projects. Regardless of the choice made, major maintenance and capital renewal and replacement require supervision by facilities management staff to coordinate campus conditions (e.g., access during construction, interim relocations, utilities) and ensure project delivery in conformance with specifications, budgets, and schedules. From the early 1980s, deferred maintenance began rising on the agendas of facilities managers, chief financial officers, presidents/chancellors, and governing boards. However, to some, deferred maintenance suggested that someone was responsible for a deliberate policy to ignore renewal of older facilities. Indeed, a stigma was attached to a senior facilities officer reporting that significant funding would be necessary to remedy unsatisfactory conditions. “Who,” it was asked, “was in charge when these problems developed?" Or, “How did you (we) spend the millions allocated for maintenance?” Or, “Why exactly did you (the administration) defer this maintenance?” In these cases, it was useless to point out that maintenance was deferred by leadership through many policy and annual budgeting decisions over a long period of time—not to mention the overwhelming tilt to new facilities in capital budgets. An ostrich-like attitude sometimes resulted, as professionals were tempted to suppress bad news, to limit exposure of liability risk due to unsafe conditions, or to avoid criticism and embarrassment about management failure—real or perceived. It turned out that the term deferred maintenance became a problem in itself in capital renewal communication. Perceptive facilities and financial managers, seeing that the phrase deferred maintenance reduction presented semantic barriers and resistance to acceptance, sought other descriptive terms. The phrase spoke of failures in management, judgment, and stewardship, as though deferred maintenance were a trait of inept management. What followed was a shift in focus to programs of comprehensive financial and facilities planning, adopting terms such as capital renewal, facilities equilibrium, capital asset management, and strategic capital development. The reader can sense that there has been a semantic or appellation challenge in all this evaluation from repair backlogs to deferred maintenance to capital renewal. And there are still other terms in use. For example, the U.S. Navy uses sustainment as the generally accepted definition for maintenance, and recapitalization to describe work that is intended to restore lost service life or to extend the service life of facilities.3 The Navy’s use of recapitalization includes restoration, modernization, or replacement of facilities, but not the acquisition of new facilities. In its definitions, the Navy avoided the terms deferred maintenance and “backlogs,” and used the term recapitalization to include restoration of facilities that may have had inadequate sustainment. To establish a “gold standard” definition for deferred maintenance, the FASAB definition, in Amendments to SFFAS 6, Para. 77, addressed any possible confusion: "'Deferred maintenance' is maintenance that was not performed when it should have been or was scheduled to be and which, therefore, is put off or delayed for a future period." "Condition assessment surveys are periodic inspections of property, plant, and equipment (PP&E) to determine their current condition and estimated cost to correct any deficiencies. It is desirable that condition assessment surveys be based on generally accepted methods and standards consistently applied." "Life cycle costing is an acquisition or procurement technique, which considers operating, maintenance, and other costs in addition to the acquisition cost of assets. Since it results in a forecast of maintenance expense, these forecasts may serve as a basis against which to compare actual maintenance expense and estimate deferred maintenance." In a review of deferred maintenance reporting requirements5 of the FASAB Standard Number 6, as Amended, the Federal Facilities Council (FFC) delineated the three major renewal assessment alternative methodologies: (1) surveys based on field inspections, (2) mathematical predictive models, and (3) a combination of surveys and models. The FFC’s review of the alternatives concluded that the condition assessment survey (or field inspection) was a more costly and time-consuming methodology, although it does produce information useful for direct application in project planning. In the condition assessment survey methodology, experts visually inspect the buildings and infrastructure for deficiencies, estimate remedial action, and prioritize projects. In predictive models, based on life cycle costing, a mathematical model is used to estimate deferred maintenance backlogs and to predict future plant renewal needs as the difference between actual expenditures made and facilities capital renewal needs over a given period of time. The statistical, approach of a predictive model is cost-effective, costing typically about one-tenth as much as condition assessment surveys. It is suitable for capital budgeting and planning, but it is not useful for application to project planning. To balance cost-effectiveness and use of the data in project planning, a third option is a combined methodology, in which the basic approach is predictive modeling, augmented by a highly selective field inspection survey of priority facilities for which projects will be planned in the near term. Thus, as the term deferred maintenance was losing currency because of its suggestion of mismanagement or inattention, the problem was gradually redefined as capital renewal. The new term signified a broader view—not just the renewal needed due to past events (deferred maintenance) but also the concept of life cycle needs (capital renewal). This broader notion of capital renewal remains in use today, with varying nomenclature, such as asset management, recapitalization, and even strategic facilities planning. As it is commonly used and understood, the term capital renewal includes deferred maintenance but still does not necessarily include the costs of modernization or adjustments to correct functional obsolescence. Apparently, although it was correct, the 1989 idea of plant adaptation did not really catch on as common practice in capital planning. By the early 1990s, as more institutions began to tackle the deferred maintenance problem, a more enlightened view of capital planning and budgeting began to emerge. Researchers and consultants were concluding that detailed field inspections of physical conditions and estimating costs of remedial action conducted in the facilities audit had limitations. The scope did not present total capital renewal needs. The goal of the evolving Facilities Condition Assessment (FCA) became comprehensiveness, a balanced combination of data collection through field surveys for both physical conditions and functionality, and statistical projections for forecasting life cycle renewal needs. Methodology developed and published in 1991 by Applied Management Engineering (AME), in Managing the Facilities Portfolio,7 offered a comprehensive process of identifying short- and long-term facility maintenance and repair requirements. In addition, AME provided management indicators and reporting tools. For example, the Facilities Condition Index (FCI), which measures deferred maintenance backlog and is now the most commonly applied facilities metric in practice, was seen in print for the first time. The equation to calculate FCI is deferred maintenance backlog divided by current replacement value, expressed as an index or percentage. Two years later, APPA published The Facilities Audit,8 which demonstrated the trend of the 1990s toward comprehensiveness and use of electronic formats for improved data collection and analyses. Together, Managing the Facilities Portfolio and The Facilities Audit provided an updated and more detailed FCA methodology. One important change was in condition ratings. Earlier, the approach was to develop generic condition evaluation ratings, using a traditional National Center for Education Statistics (NCES) HEGIS of qualitative ranges (e.g., excellent, good, fair, satisfactory, poor). In the updated methods, this approach was abandoned in favor of actual recorded deficiencies, with associated costs to remediate. Second, the format was revised for adaptability to electronic data collection and for linking with other databases. Third, the scope of the audit was expanded to include infrastructure. Finally, an increased focus on functionality/suitability/adequacy expanded the comprehensiveness of data collection and analysis. A major breakthrough in how higher education professionals evaluate capital renewal came in various approaches that considered the entire cost of a facility throughout its useful life, as opposed to the prior concept of “one-time” capital expenditure. The following is a discussion of the cost of ownership concept and its impact on capital renewal planning and budgeting. By the late 1990s, it became apparent that a one-time deferred maintenance backlog funding program did not rise to the level of meeting stewardship responsibility for managing institutional capital facilities. There was a pressing question to answer: What about funding to prevent future accumulation of deferred maintenance? Earlier work by the BRB and other investigators provided theoretical background for the concept of total cost of ownership, which tied together adequate funding for annual maintenance, deferred maintenance backlogs, and life cycle renewal funding. Now, nearly 40 years since the first alerts were sounded about higher education’s decaying stock of buildings and infrastructure, we see more attention being paid to the problem of inadequate capital renewal assessment and funding. Through the efforts of higher education organizations—APPA, NACUBO, and SCUP—a substantial body of research and publications has been pouring forth to guide institutions in their efforts to address the issue of facilities renewal. Despite enhanced attention to capital renewal, the central problem of backlogs of deferred maintenance lingers as a substantial liability for many institutions. The fact of the matter is that information on the magnitude of the problem varies widely from institution to institution. And there is still a great gap between the awareness of funding needs and the actual funding of corrective work for deferred maintenance backlogs and the life cycle renewal. One major problem is a capital development plan prepared in isolation from the institution’s mission and vision, as embodied in an institutional strategic plan. Frequently, lack of specificity for physical planning goals and objectives and quantitative data in an institutional strategic plan stymie an assessment to determine capacity needs (space availability in square footage and functional adequacy) for current and future programs and enrollments. Another difficulty is a master planning process solving problems of current arrangements of facilities and organizing spatial relationships for new campus facilities developed independently of the vision of the institution. While incorporating grand visions, these plans are unrealistic in their reflection of needs, including those for existing facilities. Elsewhere, inadequate studies evaluating physical conditions of facilities may establish backlog remediation priorities while weakening credibility by omitting functionality/suitability needs assessment to adequately support programs. Institutions without a long-range strategy to assess facilities capacity, condition, and adequacy fail to accomplish the basic goals of a financing program: to reduce deferred maintenance backlogs and adequately support long-term capital renewal. A new model for strategic capital development is designed to generate an analytically driven and campus community consensus-based long-range plan for sustained and optimized capital investment.11 The model is an expansion of the typical master planning process to include hard analysis of how the projects defined in the master plan might be paid for and accomplished, and analysis of such elements as academic and space policy, management of project delivery, and facilities organization issues. 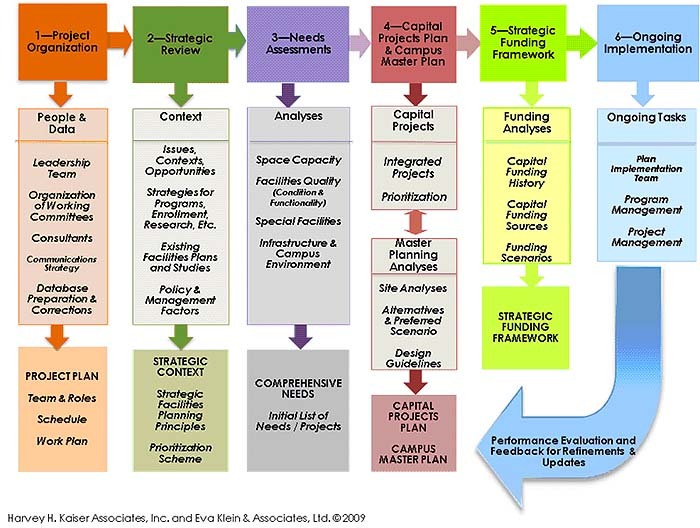 Instead of periodic and stand-alone studies of elements of the capital needs of an institution, the model defines six phases of an integrated and comprehensive (“soup-to-nuts”) planning process that begins with strategic context and existing campus conditions; then moves to comprehensive assessment of all needs and organization of those needs into a capital projects plan and a campus master plan; and then to planning important aspects of funding, implementation, and ongoing management. Moreover, while the phases are of necessity described in linear sequence, in reality, some of the phases may overlap. For example, if one of the strategic facilities planning principles defined in the course of the strategic review is “substantial completion of the plan” within a given time frame, when the funding scenarios are analyzed, it might be determined that the projects in the plan cannot be financed. One then would modify and reduce the total dollar value of the projects in the capital projects plan—deferring some projects to a post-plan period. If an institution decides to undertake comprehensive planning of this nature, the first occasion will require that the model’s six phases all are carried out in full detail and in this sequence (with iterations between some of the phases). It is a large, multidisciplinary undertaking—possibly requiring one to two years of effort and almost certainly requiring a consulting team’s technical and facilitation support. And, once done, it is never finished. The arrow at bottom right of the figure indicates that continuous updating must occur—although subsequent cycles of updating are far less concentrated and demanding than the initial efforts. An institution’s awareness that deteriorating facilities conditions have reached the point of significant liability immediately opens the question: How much is needed to correct the problem? This approach recognizes that facilities' conditions continually deteriorate over time and require ongoing investments to maintain functional and financial value; and historical facilities underfunding problems must be addressed through a short-term remedial program of deferred maintenance reduction by a heavy infusion of capital spending. The empirical guidelines in the BRB's Committing to the Cost of Ownership: Maintenance and Repair of Public Buildings are one source of macro-level estimating. The BRB addressed an array of costs associated with acquiring, maintaining, and replacing facilities to guide financial planning for integrating maintenance and repairs and reducing the backlog of deferred maintenance. The BRB's conclusions and recommendations are based on the finding that underfunding of maintenance and repair is a widespread and persistent problem. To overcome this problem, annual maintenance and repair budgets should be structured to explicitly identify the expenditures associated with routine maintenance and repair, and activities to reduce the backlog of deferred maintenance. The BRB concluded that an appropriate total annual budget allocation for routine maintenance and capital renewal is in the range of 2 to 4 percent of the aggregate current replacement value (CRV) of those facilities (excluding major infrastructure, e.g., utility distribution lines, central utility plants, etc.). When a backlog of deferred maintenance has been allowed to accumulate, spending must exceed this minimum level until the backlog has been eliminated. Some evaluations of plant conditions and needs recommend higher ranges. For example, a research-intensive institution will have a high rate of obsolescence and deterioration owing to changing technologies and use of facilities. Institutions that have implemented a deferred maintenance reduction program will see benefits in lower capital renewal and replacement needs. Note: Deferred maintenance backlog and functional improvements are excluded from this model. In general practice in higher education, the assessment of existing conditions of buildings and infrastructure, commonly known as the Facilities Condition Assessment (FCA), identifies physical and functional deficiencies of building subsystems and infrastructure, as well as deficiencies with respect to compliance with applicable codes and conformance with the Americans with Disabilities Act (ADA). The FCA, appropriate for micro-level capital renewal and deferred maintenance programming, is the subject of another chapter of the Body of Knowledge. The reader should note that the recommended approach is a comprehensive assessment, called a facilities quality assessment, which integrates the facilities condition assessment with a functionality assessment. The latter emanates from a user perspective, rather than from a building perspective, and is aimed at understanding how well the space functions, suitability for its current (or other) purpose, and similar factors. The FCA can be based on a fully detailed condition audit, a statistical forecast based on life cycle expectations, or a combination of the two, and user interviews for functionality issues. Integration of these elements provides comprehensive evaluation of existing facilities as input of the capital renewal and deferred maintenance elements of a capital projects plan. The use of a comprehensive assessment methodology for micro-level estimates includes a change from the universally accepted measure of facilities condition: the facility condition index (FCI), defined as the estimated cost to correct condition and code compliance deficiencies, divided by the current replacement value of the building. In a comprehensive model, an updated facilities condition assessment would include condition, but also functionality. Building on the concept of the FCI, a new metric, intended to capture both condition and functionality needs, is introduced as quality and incorporates the Facilities Quality Index, or FQI. In contrast with the FCI’s history of almost three decades, there is little body of data on typical FQI levels or ranges, as the methodology has not been in common use for a long period of time. Due to the combination of the estimated costs to correct condition and code deficiencies and the estimated costs of functionality-driven programmatic improvements—often resulting in a comprehensive building renovation or modernization project cost—the calculated FQIs will always be higher than calculated FCIs. In fact, for any given building, the FQI can exceed 1.0—meaning that the cost to make the building “right” from both condition and functionality perspectives (overall building quality) may exceed the building’s current replacement value. Capital renewal and replacement and deferred maintenance programs require clear guidelines and procedures for setting priorities among potential projects. The desire to balance competition for scarce resources can be satisfied by the funding source's determination of categories of projects and selection criteria. Setting priorities requires consistent treatment of deficiencies and functional improvement funding requests. Typically, categorizing involves collecting data, estimating project requests, and then summarizing project requests for a five- or six-year budgeting cycle. Selection of priorities is based on a systematic categorization established by an institution or governing board. As a practical matter, needs must be met in a certain order, and that order is dictated by financing capacity and by pragmatic considerations of logical, orderly campus development. Major maintenance and repairs in the annual operating budget should be reserved only for projects offsetting facilities deterioration and extending the life of plant assets. New construction or major renovations for program improvements should be funded separately from major maintenance and repairs. Deferred maintenance or renovations should be funded as special appropriations on a project-by-project basis. Renovations for functional improvements should be funded separately from capital renewal funding. The process of prioritizing among competing capital needs must be one of objective analysis moderated by informed personal judgments. The relatively more objective portion of the exercise balances the essentiality of the facility to the institution’s mission with the urgency of the project—usually based on relative qualitative deficiencies, but possibly including critical maintenance backlog issues that need immediate attention. The relatively more subjective portion of the exercise is a process of scoring projects based on a set of prioritization criteria or factors developed as part of a capital renewal/deferred maintenance program. The institution begins by assigning categories of facility essentiality to each major building on the campus in several categories. For example, academic buildings could be given the highest essentiality priority, auxiliary buildings a second level of priority, and “other” buildings the lowest priority. Following this process, projects are sorted by the level of urgency (based on FQIs, mandatory compliance, legally imposed, etc.). Finally, a matrix is developed for ranking all projects based on the combined factors of project urgency and facility essentiality. Although the process is designed to optimize objectivity in the analysis of issues affecting prioritization, factors such as resource availability and other issues specific to a system or institution inevitably will introduce some level of subjectivity into the process—and this is appropriate. Thus, after an initial sorting of projects is completed, a prioritization scheme will emerge, based on the methods above. The final steps are to review, adjust, and refine the prioritization based on experience and judgment (but not in a way that violates the established prioritization efforts). For example, in reviewing all projects, opportunities should be analyzed to "package" several projects for economies of scale. Roof repairs and replacements for several buildings may be consolidated into a single project to allow for lower unit pricing. Similar operations, such as erecting scaffolding or suspending use of portions of buildings, also lend themselves to cost efficiencies and minimizing building use inconvenience. Other factors do not readily lend themselves to objective prioritization but should be considered when making funding decisions. Faculty and staff morale make a positive contribution to overall productivity and can be influenced by quality of space and properly functioning, well-furnished and well-equipped, attractive, and well-maintained facilities. Faculty and staff recruitment and retention are similarly affected by the physical appearance of facilities and the architectural qualities of buildings and site aesthetics. Historic preservation is an important aspect of a campus's traditions and image. Facilities that are in marginal condition and being considered for replacement may be more valuable, because of their historical importance or as a focal point for a community, if they are retained and improved. Organizing these categories and intangible factors into a specific set of selection guidelines enables decisions based on technical evaluations and an institution's requirements. In the final analysis, selection of priorities is the relative weight given to the protection of plant assets, possible fiscal instability caused by postponing deferred maintenance or energy conservation measures, the visual image of the institution, and the risk of erosion of function and quality of environment. Although these matters may seem relatively intangible, they can be as debilitating as the more obvious physical consequences of deferring high-priority building and site repairs, loss of facility use and hampering program activities, or affecting economies. Projections of costs estimated for capital renewal/deferred maintenance at the macro and micro levels are useful to gauge the magnitude of funding needs. However, these projections typically fail to associate the "how much" with the "from where" considerations of funding. For some capital needs, the source of financing is self-evident. For example, new student housing or housing renovations will be financed, almost always, from housing system revenues and as revenue bonds. We can presume that, for private institutions, major utility improvements are more likely to be funded from operating funds or bond proceeds than from donor gifts and so forth. The sources of funding capital renewal/deferred maintenance share the same issues as capital financing for newconstruction, a widely varying pattern of arrangements across the country. An analysis of national activity is a complex task: definitions vary among the states regarding operating and capital funding; the specific allowable usage of tuition, fees, and capital funds vary from state to state; and some states define their capital budgets as consisting only of major building projects, while others include major building projects, equipment, and repairs/renovations. An example of the varied sources of capital funding for Texas public universities is shown in Figure 3. Other Revenue Bonds Bond financing, authorized by an institution's board of regents, that can be repaid by proceeds from sources of revenue other than tuition. View a facility as a collection of components and systems. The deterioration of one component can cause breakdowns in other parts of a system. Evaluation of a repeated maintenance problem should consider the systemic nature of facilities. Maintenance management staff pooling knowledge of unsatisfactory conditions that are developing into major problems can offset facilities deterioration. Keep track of facilities conditions. An annual audit of physical conditions to note current problems and priorities should be a basic practice of facilities management. Familiarity with conditions enables the facilities manager to become aware of the most pressing needs. Lack of knowledge of conditions prevents anticipating major problems and avoiding budget surprises for overall campus fiscal management. Maintain a five-year major maintenance and capital renewal program. A five-year capital budget plan provides a level of confidence for senior administrators in the facilities management staff by regularly reviewing overall campus capital requirements. A level of capital requirements is established in long-range budget base planning, offering flexibility for emergencies or special situations that cannot be anticipated. Finally, the facilities manager has an operational framework for maintenance management to direct staff, materials, and contractors to appropriate priorities. Know the differences between maintenance, repairs, and major maintenance. The categories may sound so routine that the important differences are overlooked. A simple check on the practices of work management and control is the proportion of staff devoted to routine building and preventive maintenance and the proportion devoted to major maintenance. Although many facilities managers take justifiable pride in their staff's construction accomplishments, they are mistaken if they look at their labor pool primarily as a construction team. Unless the facility is located in an area where competition from contractors is unavailable, the wrong emphasis is being placed on work management if the majority of staff labor hours are allocated to major maintenance “construction” projects. Manage maintenance as opposed to maintaining management. Any size institution needs a work management system to assign tasks, control material purchases, and be a responsive service organization; obviously, the size and complexity of an institution dictates the degree of sophistication of a system. Similarly, annual capital budget planning is part of a multiyear capital budget plan that integrates all funding streams with work priorities. Failure to bring these basic management programs into routine operations is a sign of complacent management and of an organization prepared to complain about inadequate funds and a lack of appreciation for staff that is dedicated, loyal, and hardworking. View facilities management as a support service. A central purpose of an academic enterprise is to maintain the quality of its academic programs. Maintaining the quality of campus life for all members of the campus community is a close second. In terms of allocation of resources, facilities come in at best third. Something else, it is hoped, may qualify as last. Disappointment in the occasional short shrift in facility funding can be overcome by accomplishment in providing efficient service. Prompt responses to requests, explanations for delays and postponements, and attention to meeting the specific requirements of a college or university are traits of the service organization. Understanding these principles can create a fresh approach to capital renewal/deferred maintenance practices and procedures. The facilities manager should take good stock of the condition of the plant, including buildings, grounds, utilities, and equipment. Walk through the buildings, keeping in mind the operations and maintenance budget. Be candid in the self-evaluation of the maintenance management's effectiveness. Also, have a feel for the previous annual funding for major maintenance and the tempo of plant additions. (A quiet period or increase in activity? A shift from new construction to renovations?) Set aside frustrations over "inadequate" budgets and be self-critical of work control, staff performance, and the presentations of requests for increased base budgets and special capital appropriations. As you walk the grounds and through buildings from basement to roof, take note of deferred maintenance, especially for safety problems and a building's exterior envelope—roofing, flashings, mortar, or other sealants—and places where deterioration permits moisture penetration. Check the operating records for failures of mechanical systems and complaints about heating and cooling. Finally, observe environmental safety conditions such as exits, toxic waste storage, sprinkler systems, and smoke detectors. Observe for any obstacles to disabled individuals. This is an informal checklist to set the facilities manager to the task of preparing a strategy for a capital renewal/maintenance program. Formal aspects of the program begin with senior plant administrators evaluating the overall facilities management program for the institution. Later, tasks are defined for the administrator of the small campus to personally take on with available assistants, or, at a larger campus, for the delegation of staff. Build a constituency of campus support. Create public awareness of facilities conditions and funding needs. Continue the cycle until results are produced. These actions are necessary to prevent further plant deterioration and protect capital assets. 1 Choate, Pat and Susan Walter. 1983. America in Ruins: The Decaying Infrastructure. Durham, NC: Duke University. 2 Kaiser, Harvey H. 1993. Facilities Audit Workbook: A Self-Evaluation Process for Higher Education 1982, revised as The Facilities Audit. Washington, DC: AGB, APPA, NACUBO. 3 The sustainment rate is the product of sustainment funding divided by sustainment requirement (SF/SR) and measures the adequacy of funding for facilities maintenance and repair (but not the adequacy of funding for capital renewal and replacement). The recapitalization rate is the product of the expected service life divided by the funded service life (ESL/FSL). The minimum goal of both metrics is 1.0 (i.e., 100 percent). 4 Federal Accounting Standards Advisory Board (FASAB) Amendments to Deferred Maintenance Reporting in Federal Financial Accounting Standard No. 6, Accounting for Property, Plant, and Equipment and Governmental Accounting Standards Board (GASB) Statement No. 34: Basic Financial Statements—and Management’s Discussion and Analysis—for State and Local Governments. 5 Federal Facilities Council. 2000. Deferred Maintenance Reporting for Federal Facilities. Technical Report Number 141. Washington, DC: National Academies Press. 6 Dunn, John A., Jr. 1989. Financial Planning Guidelines for Facility Renewal and Adaption. Ann Arbor, MI: Society for College and University Planning. 7 Applied Management Engineering and Sean C. Rush. 1991. Managing the Facilities Portfolio: A Practical Approach to Institutional Facility Renewal and Deferred Maintenance. Washington, DC: NACUBO. 8 Kaiser, Harvey H. 1993. The Facilities Audit. Washington, DC: APPA. 9 National Research Council. 1990. Committing to the Cost of Ownership, Maintenance and Repair of Public Buildings , p. 3. Washington, DC: National Academies Press. 10 Kaiser, Harvey H. and Eva Klein. 2010. Strategic Capital Development: The New Model for Campus Investment. Alexandria, VA:. APPA.